Hi, I'm Traceyann from Guyana, the only English speaking country in South America.. I started my Diaper Cake Business about 1 year ago. The idea is new to our Country. 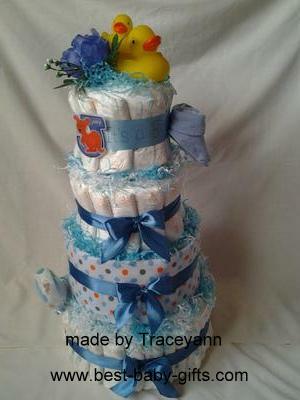 The duck diaper cake for a baby boy contains 75 diapers, 1 onesie, 1 pair of booties, 1 receiving blanket and the cute bathing duckies of course. Tucked inside are baby gooddies such as Johnson Products, baby bottles and others. 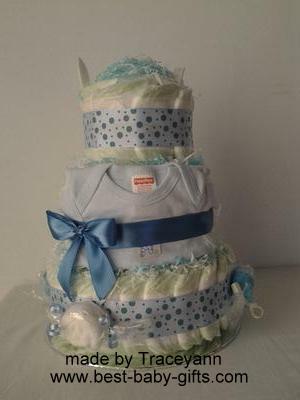 The boy diaper cake in blue contains 75 diapers, 2 onesies and inside are Johnson Products, baby bottles, washcloths, etc.